I bought this planer about a year and a half ago. I wanted to upgrade my 13” lunchbox planer and figured that there was no sense just upgrading to 15”. I can’t remember what lead to my decision to go with the Powermatic over other brands. 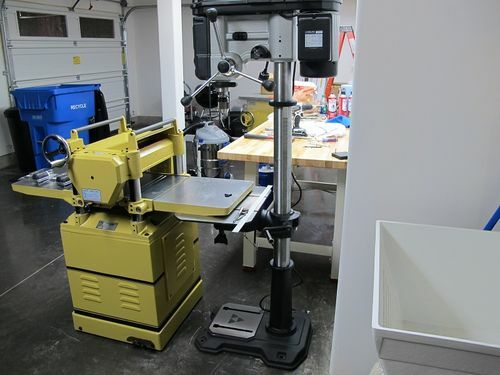 The planer is heavily built and came with large, cast iron extension tables. Built in wheels made it easy to move around, thankfully because it is almost 800lbs! It also comes with an extra gear sprocket and gear chain to change the feeding speed from 16-20FPM to 24-31FPM. Overall it works very well with very little snipe. Bottom line. The extension tables are difficult to align properly, but I imagine that this is similar for every machine (certainly the case with my jointer and TS). My only disappointment with the planer is the dust collection. It comes with a 5” duct hood which is silly (why not 6” in this industrial sized machine??) and the duct is parallel to and located only a few inches above the planer table which often leads to wood hitting the ducting. This is a stupid design. Even pointing the duct a few degrees upwards would have made this better. As usual with a lot of machinery, the dust collection seems to be an afterthought. Otherwise the planer would be excellent. I have the same planer. I agree with the shortcomings that you pointed out. Overall, I’m very satisfied with the machine. I feel many planners have the same flaw.thanks for the review. Interesting about the DC. Guess that would be something to look for. I suspect I will be in the market for a better planer as well, but it is always a question as to where to put it. Thanks for the detailed review. I had assumed that an 800 lb cast iron planer like that would have no snipe to speak of. All planers have snipe unless they are perfectly tuned. The trick is getting them to stay properly adjusted as they are used. The duct has go out horizontal because of the wood return rollers on the top. I just put a horizontal 45 elbow to kick to the right on mine. It would be interesting to talk with the folks who actually design these machines, or at least the folks whom accept that the design doesn’t need fixing and find out what their thinking is. My PM 15HH dust port is parallel but does angle off at 45 degrees. Here is how I install/align planer tables, and table saw extension wings, and fence rails. No snipe on mine, zero, I was stunned. I had the Grizzly version of this planer and it was snipe city. Curious, what doesn’t it do that it is supposed to do?